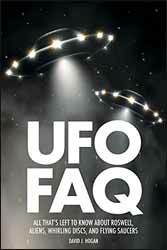 UFO FAQ is an interesting, if rather odd, entry into the world of the UFO phenomenon. It's interesting because it pretty much gives a thorough history; odd, because it is too technical for the casual UFO fanatic yet covers too many basic elements for the more seasoned ufologist. Over the course of these 424 pages, readers will meet cultists and explore worldwide UFO "hot spots." They'll learn about UFOs in World War II, the Cold War, and the age of terrorism. And they'll zip along with UFOs in movies, comics, TV, and other popular media. Also featured are an international UFO timeline and a valuable UFO checklist that includes step-by-step suggestions on how to prepare and make the most of your UFO sightings - while ensuring your credibility. Illustrated with nearly 100 photographs and drawings, UFO FAQ combines historical accuracy, provocative speculation, and compulsive readability in one handy volume. And that, possibly, is this books downfall. How could you possibly hope to cover all that in 424 pages? In fairness, David J. Hogan does as good a job as can be expect, cramming things in as tight as possible. I suppose the idea is to give the reader a taste of every possible angle on the subject, in order that should a certain aspect intrigue then they can go on to research that area in much more detail. Whether you're new to the world of UFOs, and just want a book that covers everything, or you're a seasoned sky watcher and want the basics all in one handy volume, there's much here to sink your teeth into.